Home > What Has Tahoe Truckee Homes Been Up To? 2017 was a heck of a year! 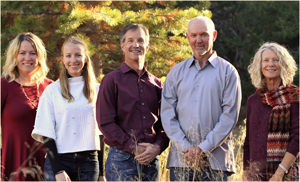 With so much going on personally I was grateful to have a year of business Tahoe Truckee Homes could be proud of. While it was not our best year ever, it was a year of change, growth, firsts and strong sales. We updated the office which if you haven’t seen please stop by. Worked on a completely new user and mobile friendly website www.TahoeTruckeeHomes.com. Kappy Mann and Jennifer Beohm joined the office. Lauren continues to grow the rental fleet which now offers 11 short term, 12 long term and 2 seasonal rentals. Tim Mehan is building another spec project in Gray’s Crossing he plans to have on the market this spring. I managed to get assigned to a couple new positions including Chair of the Gray’s Crossing Design Review Committee and alternate for The Tahoe Sierra Board of Realtors seat of the new Mountain Housing Council of Tahoe Truckee. This council is about helping with local housing in our region. Finally as we prepared for the holidays I attended my annual Tahoe Sierra Board of Realtors directors installation dinner where I was being installed and received the TSBOR Realtor of the year award. Needless to say it came as a shock but I felt truly honored to receive it. We are all excited to jump in to 2018 and make it our best year ever. That said, we can’t do it without you and your support. If there is anything you need please know we are here to help. As you will see with the new website, With Us, It’s Personal.